Do you want to get started blogging? I’m sharing 5 Tips to help you get started blogging. Your blog doesn’t have to be perfect—be consistent and be yourself! Blogging doesn’t have to be hard and it is an important way to get visibility and grow your business! I’m sharing my top blogging tips to get you started (and keep you going!). This can be as simple as using Google’s calendar on your drive. Grab a piece of paper and jot down at least 10 different blog titles. Outline the main points that you want to talk about in each post and then get them scheduled on your calendar. Aim to publish a blog post at least once a week to get the full benefits of search engine optimization and also develop the habit of consistent blogging. Learn how to optimize your post by choosing keywords that will lead to ranking on search engines. I use Yoast on WordPress—it’s free and helps you structure your blog post with strong keywords and guides you where to use the correct headings. This one’s a gimme. As a Pinterest strategist, you knew I was going to suggest being Pinterest-friendly, right? Try to include at least one (often, I make two) Pinterest-optimized images at 600x900px. 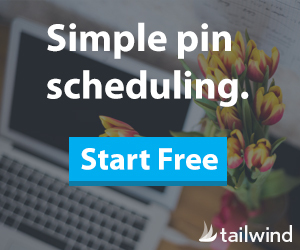 You can use tools like Canva to get you started creating pins. If you want my guide to create Pinterest-friendly blog posts to generate traffic and encourage your users to save your posts, click here! If you have someone on your site, don’t forget to invite them to your email list! I like to include a opt-in box in the middle of the post and at the end to encourage them to join my list! Your blog doesn’t have to be perfect! I know this is cliche, but the more you blog, the easier blogging becomes! I’ve been blogging weekly since August 2017 (except for the week of Christmas) and I’m surprised at how consistent I’ve been. Now I prioritize it because it has led to huge returns for my business. Just get out there and do it! I’ll be on the sidelines cheering you on! You can find the resources I use to keep my blog going at my blogging resources page. If you want to use Pinterest to drive traffic to your site (and you should because it’s amazing), I’d love for you to grab my FREE Pinterest Start-up Guide for your creative small business where I give easy actionable steps to getting started on Pinterest! DID YOU LIKE THIS POST? DON’T FORGET TO PIN IT!